State and federal criminal trial court cases are complex proceedings, so hiring a highly experienced and seasoned criminal law attorney is always in your best interest. The firm of James S. Friedman, LLC, has represented adult criminal defendants in the state and federal trial courts of New Jersey and New York City for many years. Attorney Friedman provides aggressive and personalized defense strategies in cases involving indictable or non-indictable offenses in New Jersey, and felonies or misdemeanors in New York City. With extensive experience in all types of criminal cases, the firm works with its clients to evaluate their case and set a course that will lead to the most positive outcome available under the circumstances. In every criminal matter, Mr. Friedman always seeks to achieve the client's goals in a cost-effective and pragmatic way, while aggressively protecting their legal rights. While it may be desirable to resolve a case by way of plea, any adult criminal matter can proceed all the way to trial and a jury verdict. 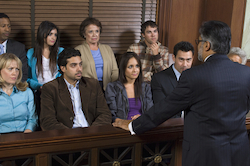 Mr. Friedman handles criminal jury trials in all State and Federal trial courts of New Jersey and New York City, including the Superior Court of New Jersey, the New Jersey municipal courts, and the New York City Criminal Court. He also represents clients at trial in the United States District Court of New Jersey, and in the United States District Courts for the Southern and Eastern Districts of New York. Extensive experience in the New Jersey municipal courts, New Jersey Superior Court, New York City Criminal Court, and all Federal courts in New Jersey and New York City, provides all of Mr. Friedman's clients with the benefit of his wide-ranging perspective. Attorney James S. Friedman understands what is possible, what is practical, and how to protect constitutional rights and achieve favorable results in adult criminal matters. Mr. Friedman also believes strongly that straight-forward and open communication assists clients in understanding their situation and achieving their personal goals. To schedule a consultation to discuss your adult criminal case, call Mr. Friedman at 800-361-6554 (toll free) or contact him online.